Was pulling out a way of showing an upcoming American president that Israel was serious in talking peace with this new mediator? Did Israel pull out because United Nations' pressure was forcing Israel to expedite their maneuvers before a U.N. censure was enacted or peace keeping troops were inserted? 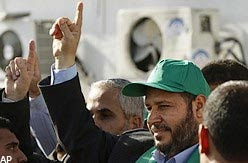 Or, is it true as Hamas leader Khalil al-Hayeh had declared, "We say proudly that Gaza has won the war, the resistance has won the war, and Hamas has won the war" (reported in The Jerusalem Post, Friday, Jan. 30, 2009). The searing reality of Operation Cast Lead, though, is that Israel only temporarily achieved their objectives. Hamas continues to have an iron control over the people of Gaza, abusing their fellow Palestinians like hostages. The launch of missiles into southern Israel continues with more than 280 rockets and mortars fired at Israel since the end of Operation Cast Lead. Aid poured into the country for rebuilding like never before, which Hamas intercepted and used to fund their rearming. In the Muslim world, the scrappy little resistance against the "Zionist regime" won Hamas great honor. In the free world, though muffled comments did arise that Israel had the right to protect itself, the largest gathering of world voices led by U.N. Secretary General Ban-Ki Moon shouted that Israel was the evil aggressor and is seeking to bring up Israel for war crimes. By the end of the conflict, it became too obvious that Israel lost the public relations war, a war that Hamas is clearly an expert at winning. There is no doubt that Israel looks friendless, helpless and hopeless against these staggering odds. And, that's exactly how God likes it! As 1 Corinthians 1:27 states, "But God chose the foolish things of the world to shame the wise; God chose the weak things of the world to shame the strong." In their apparently weakened state, Israel is looking ahead to what will prophetically be their biggest victory — first through the Psalm 83 subjugation of their hostile Arab neighbors and the nuclear destruction of the biggest hot seat of terrorist activity in Damascus (Isa. 17; Jer. 49), and then the Gog-Magog Battle (Ezek. 38-39). After that, with Hizballah wiped out in the north and Hamas gone in the south, Israel could sit pretty -- for a minute anyway. Anon said "The truth is that if the bible is read without preconceived ideas about a pre-trib rapture..."
I read it WITHOUT preconceived ideas...I didn't even know what it was...and I concluded pre-trib. So much for that theory. Anon said "the classic "rapture verses" in Thes. and Cor. are speaking of the resurrection..."
Anon...nice try but not a convincing argument for me. But just in case anon reads, I'd like to ask this question - presumably the woman is Maggie MacDonald. If that's the case then please provide a pre-trib rapture statement from her. It should be simple enough. ...Throw a rock? Did anyone get hurt??? "...NOT a new doctrine. ephreaum the syrian (325 A.D.) taught it." "...This steadfast belief...carried well into the third century. It was never embodied in any formal creed as such, but was written about and taught by a wide range of distinguished teachers, including Barnabas, Papias, Justin Martyr, Ireneus, Tertullian, Methodius and Lactantius. Only a few opposed the millenial view, namely Caius, Origen, Dionysius and Eusebius....after the Council of Nicea a new eschatology arose. ...but from the early centuries and later times the pre-tribulation Rapture of all true believers was kept alive and revived by small sects of Biblical literalists like the Anabaptists and Waldenses. ...a Jesuit priest named Emmanuel Laconza came up with the pre-trib Rapture in his book written eight years before John Darby first preached his view. What would really clinch the matter...Well, there are two sources I would cite--one from the early second century and another from the fourth century--that clearly teaches the imminency of the Rapture. The first is called The Shepherd of Hermas, which was published at the end of the first century AD, likely written soon after John completed his Book of Revelation in 96 AD. This book The Shepherd of Hermas was even regarded as Scripture by Ireneus in 180 AD, but didn’t make the final cut for our canonical writings. This author--who is named in the Book of Romans 16:14--gives his End-Times teaching in the form of a vision which he relates to the Book of Revelation. I’ll quote here from that book--"I saw a huge beast (a la Revelation, chapter 13). The beast has four colors (which echoes the four horsemen of the Apocalypse in Rev. 6). It is 100 feet long, but I escaped from it, thanks to the grace and power of God." RG said..."I find it difficult to take seriously anyone who mentions Darby and MM in the same breath." Vs 8 explains further that after the restrainer ceases to restrain - AND THEN the lawless one will be revealed. I remember now, if the Rapture of the Church is tied in with the annual Jewish feasts, then that means the Rapture wouldn't be imminent - but it is! EI, Excellent point! "...but John had not written Revelation when Paul wrote Corinthians 15:51-53." LtheT.1. 2 Thes 2:1-3 says that they were shaken and troubled that the day of Christ was at hand...that WOULD be something to be concerned about. However, it doesn't at all prove they thought the RAPTURE had already happened. It shows that they were afraid the day of the Lord was at hand THEN, but Paul says no, not yet. Also, to believe that we may not be "raptured" before at least part of the tribulation is not a death wish. There are still promises of protection...that doesn't mean one has to be removed to be protected. Also, my reasons for believing that the resurrection of the living and the dead (dead first, of course) may take place later have nothing to do with a desire to be martyred...just a desire to be prepared for serious life-changing situations. Neither do I believe that being here for, say, the first part of the tribulation would be equal to being appointed to wrath, the wrath could be the end judgements of Revelation.